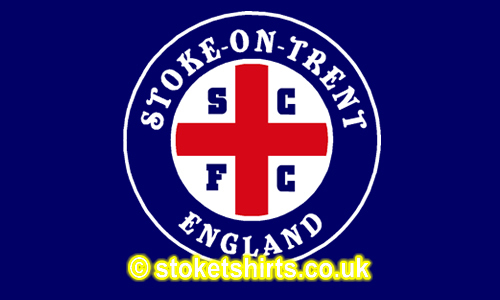 With the World Cup, The Potters Holidays and Father’s day on the near horizon we have put together a couple of designs that any Stoke City & England supporter will be proud to wear. All self respecting Stokies do the “tip it over and see where it’s made” action when handling pottery. Sir Stanley Matthews was renowned for this on his frequent travels abroad. With this design there’s no need for people to tip you over because they will know exactly where you were born. So what better way to declare your roots on the beach (or for the World Cup) this summer than this simple, does-what-it says-on-the-tin design. A distinctive “maker’s stamp” declaring where you’re from – almost down to street level. The St. George roundel in the background and the unmistakable symbol of Stoke – the bottle kiln in the middle. 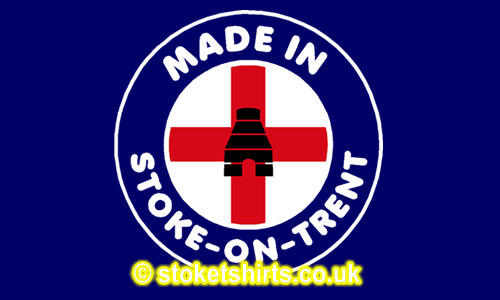 100% Potteries – like the best ceramics! Club or Country? The dilemma every proud football fan faces – what is more important – especially when selecting your attire for the game down the pub this summer. Or maybe the same issue when picking your holiday attire? Take the indecision away from the situation with this specially created design with Summer and the World Cup on the horizon. A distinctive “maker’s stamp” design declaring where you’re from and who you support – club AND Country. 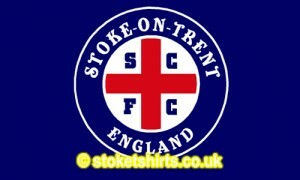 The St. George roundel in the background and the initials SCFC in the quarters. Leave your comments with your thoughts. 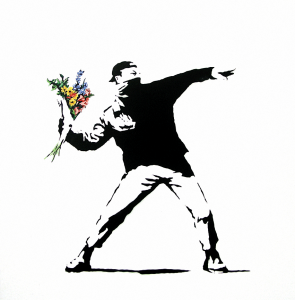 Art and The Real Banksy – Is this him unmasked? The Artbay in Fenton is holding a “Spirit of ’66” exhibition which runs from May 22nd. to May 29th. The exhibition is to celebrate the incredible feeling of togetherness, which comes along for every major football tournament. 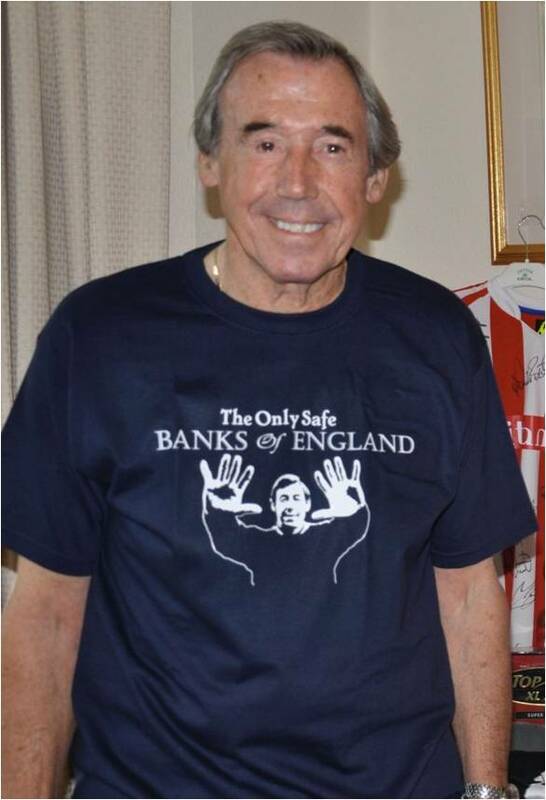 Gordon Banks will be creating a piece of Art very shortly at the Artbay and this piece will be auctioned for his Safe Hands charity fund which, over the last 10 years, has raised more than £150,000 for sick children at the University Hospital of North Staffordshire. He will also be involved in judging and presenting the winners of a children’s art competition that is being organised to coincide with exhibition. Under-16s are being asked to produce a piece of artwork reflecting the feeling of camaraderie, charity and goodwill surrounding international sporting tournaments. A shortlist of 10 entries will be framed and put on display in the gallery and all the young artists will be invited to meet Gordon at the gallery on Friday, May 28. Closing date for the exhibition is Friday May 21st. A panel of judges including local artists and Gordon will then choose a winner who will receive a prize of a perspex/acrylic print of their work worth £300. All submitted pieces will be available to view throughout the week-long exhibition in binders. 10 winners will have their pieces framed and shown alongside the other exhibitors’ works and will be invited, with a guest, to the gallery on Friday 28th May to meet Gordon Banks and receive their prize. One, overall winner will be announced on the night and will receive the top prize of a perspex print of their artwork signed by Gordon. Requirements. Artist must be aged 16 or under. The size of the submitted work must be A3. There are no restrictions on media. Entries will be judged on the degree to which the artist has captured “The Spirit of ’66” in his/her piece and the artistic quality of his/her piece, commensurate with age. All pieces must be received by the gallery no later than Friday 21st of May. The judging panel’s decisions are final. This got me thinking (which as you may know is dangerous). 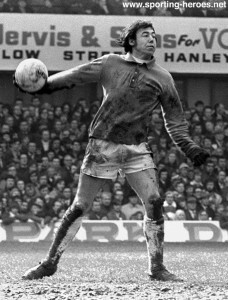 Gordon Banks football career finished in the mid 70’s. During the next few years did Gordon study art? 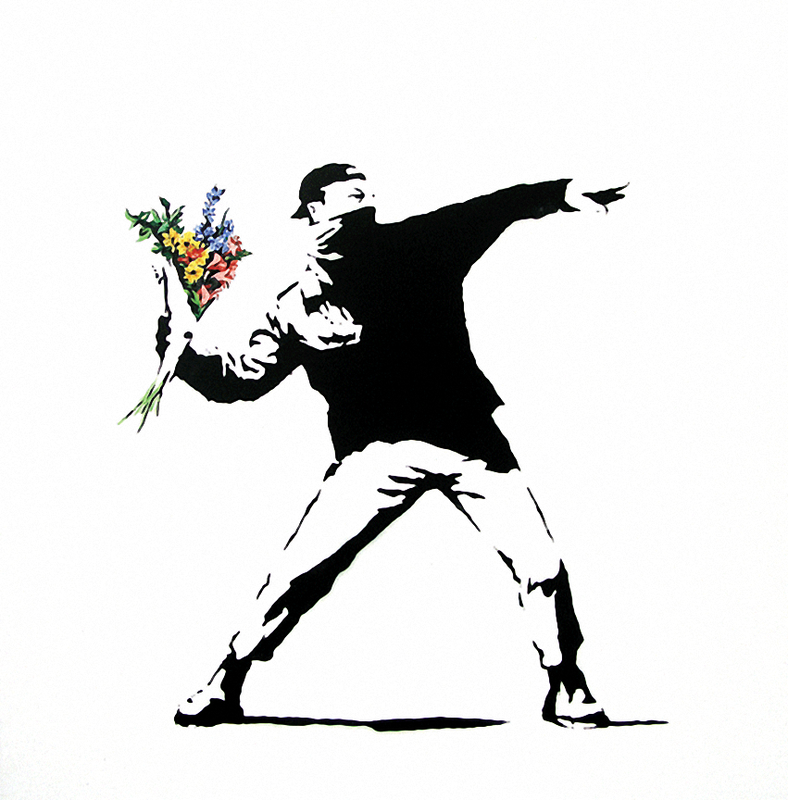 The prominence of an artist, who has managed to rise to fame while keeping his identity hidden is goes under the name of Banksy!! Our depiction of Gordon is shown below and this was proudly modelled by the great man himself. 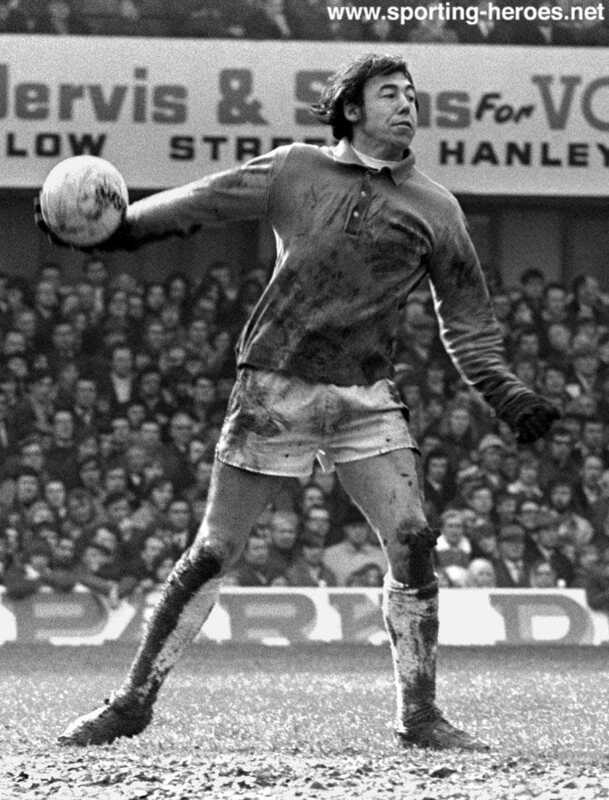 The belief is that when Banksy’s football career ended, he went off to study art and witnessed Crass play Tunstall Town Hall in April 1982 and started to create artwork for the collective. This preceded his rise to fame with various artworks around the Bristol area. Reflecting on brilliance, low key preparation and a get well soon.